The sliding doors are durable and are available in a variety of colours such as white, natural, charcoal and bronze, styles and sizes to choose from. 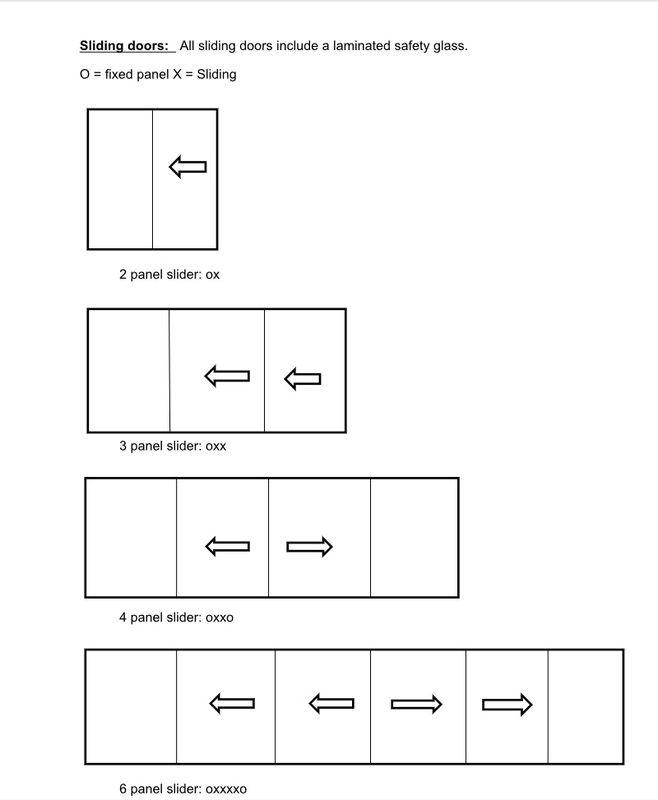 The sliding door panels range from 2; 3; 4; and 6. All doors have a standard height of 2.1m high as well as 2.4m high. The sliding doors can have sidelights or top lights attached to the sliding door if need be. The sliding doors include 6.38 safety glass. To add more security for the sliding door, you can ask for a night lock which you can ask for one or two which goes on the top or/and bottom of the door as it stops people from lifting the sliding door out of the frame. Patio doors: It is an economy range sliding door system. The sizes range from 1.5m – 7.5m in width. The panels range from 2-6. The patio doors include toughened safety glass, nylon rollers and a latch with no key. Palace doors: This is a heavy duty sliding door system where the doors slide left or right or both ways. There are different handles to choose from. Palace doors come with hook locks and pull handles, making them more secure than patio doors. Elite doors: It is a sliding door, similar to a patio door but it is made with different material, such as toughened glass, heavy duty rollers and a stainless steel laminated hook lock with a pull handle. Renaissance doors: These doors are made with better material and come with laminated safety glass and a hook lock. The quality of these is between the Patio and Palace doors. Sidelights: This is windows that are on the side of the doors. It can be all windows or windows and fixed panels.